On Saturday March 21, at approximately 2:00 p.m., the Calcasieu Parish Sheriff’s Office responded to a single car accident near the intersection of Old River Road and McMahon Loop in Starks, where the front seat passenger, James Reeves, 49, 946 Gambrell Church Road, Starks, was pronounced dead at the scene. The driver, Clayton G. Woodard, 24, 4658 Howard Road, Starks, was transported to a local hospital with serious injuries. Neither the driver nor passenger were wearing a seatbelt at the time of the accident. As mandated by state law, a toxicology report was conducted on Woodard and submitted to the Southwest Louisiana Crime Lab for testing. The toxicology report indicated Woodard’s blood alcohol content was over the legal limit at the time of the crash. On April 9, Judge Ronald Ware signed a warrant for $17,000 for Woodard’s arrest. 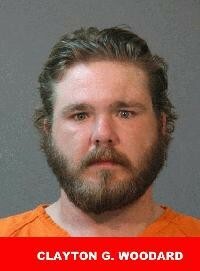 On April 10, Woodard turned himself in and was booked into the Calcasieu Correctional Center and charged with DWI; careless operation of a motor vehicle; and vehicular homicide. CPSO Sgt. Chris Ramos is the lead investigator on this case.